The Arnold Law Practice provides personalized representation to companies and private individuals. Our attorneys try cases and appear before state and federal regulatory agencies. We counsel clients on contracts, leases and insurance. We help clients comply with government orders. 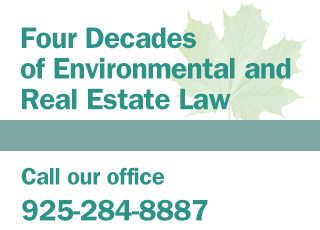 We represent them in transactions that involve environmental issues and other specialized real estate matters. Facing a Troublesome Environmental Issue in Your Business? We advise clients on selling and buying properties, particularly as to environmental due diligence and apportioning environmental liability in real estate contracts, leases and other agreements. We represent clients in disputes as to spills, leaks, releases, air emissions, cleanup costs, and damages. We also focus on legal problems with title, eminent domain, inverse condemnation, roadways, trespass, nuisance, specific performance, and other specialized real estate legal issues.